"Sampath Speaking" - the thoughts of an Insurer from Thiruvallikkeni: bittu - the cheat code in exams ... and girls do better than boys !! bittu - the cheat code in exams ... and girls do better than boys !! Dan Ariel’s book is titled :The (Honest) Truth About Dishonesty: How We Lie To Everyone — Especially Ourselves. He talks about how society's troubles aren't always caused by the really bad apples; they're caused by the scores of slightly rotting apples who are cheating just a little bit. Central Board of Secondary Education (CBSE) has announced the results of class X examinations 2016 on its website. The total pass percentage stands at 96.21 per cent, but it has fallen compared to the previous year in which 97.32 per cent students passed the examinations.Thiruvananthapuram city, the capital of Kerala, has the highest pass percentage at 99.87 per cent followed by Chennai region which had a pass percentage of 99.69 percent. Girls scored higher with an average score of 96.36 per cent while boys averaged 96.11 per cent. Generally, in all such examinations, Girl students get higher % of marks and distinctions. This time, of the 1,68,541 students who scored a full CGPA of 10 points, 85,316 were male and 83,225 were female students. Moving slightly away, cheating in exams has been in vogue – it is a malaise in the Education system. Though it is prevalent across globe, some places it is really bad. 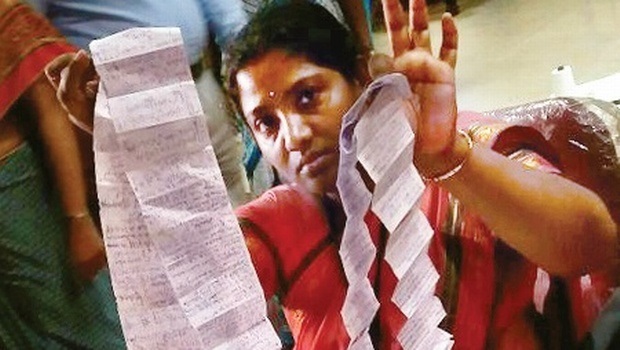 Sometime back, in Bihar a photo of parents risking fall of 20ft and more, trying to help the kids inside cheat on their high school exams by throwing them notes through the windows went viral. One leading daily exclaimed screamed ‘in Bihar, this is called reaching Greater heights’ and the photo had its reverberation globally appearing in Telegraph UK and other papers too.One of the big misconceptions, however, is that it is only these struggling students who cheat, when in fact studies show that high-achieving students cheat almost as much as other students. In examinations, dishonest attempts are not new and that includes impersonation. From famed ‘bits’ to chasing and changing papers, to impersonation – all place such errant students above those who are by nature intelligent and had worked hard !! The Kamal Prabhu Prakashraj starrer Vasool Raja MBBS was a hilarious comedy. Rajaraman, a small time don gains admission in Medical college by forcing Dr Margabandhu [Crazy Mohan] to impersonate and write exam his behalf. .. … then when a tough internal exam is set, Kamal writes the exam with the help of Crazy Mohan through Bluetooth ! In Sankar’s Robot – Enthiran with the storyline of Sujatha, Chitti helps Sana [AishwaryaRai] first by voice and then by emitting the visual images of books reflected near her. A couple of years ago, the shameful incident of a school in Thiruvannamalai - Mount Saint JosephMatriculation Higher Secondary School (known as Mount School) caught in the shameful act of organised copying resulting in suspension of 7 teachers, Principal of the school being relieved of examination duty caused sensation …. In 2009, Madras High Court dismissed a petition by over 20 teacher training institute students, who were caught by a ‘flying squad’ for adopting the ‘Vasool Raja MBBS’ technique of using cell phones to answer questions in examination. Girls score better than boys has been the routine headline, and it now turns out they are also way ahead when it comes to cheating at the exams. Bangalore University’s undergraduate exams are now in progress, and flying squads have caught more girls copying than boys. Of 43 cases booked so far, 33 are against girls, reports New Indian Express, Bangalore edition. K N Ningegowda, Registrar (Evaluation) is quoted as telling Express, “Girls are emboldened as they assume the squads, usually made up of men, cannot frisk them. Looking at the number of cases against girls, I have now decided to send a woman member in each squad.”In some cases, the girls were hiding pages and pages folded up, and not just chits. “We were surprised to see the notes hidden in their clothes. Of course it is impossible for a male squad to check them,” said Sangeetha, who co-ordinated with the squad to catch out the girls. “All of them were trying to copy from paper, and not with the help of gadgets,” Gowda explained. Mobiles and watches are barred from the exam hall. A majority of the copying cases were reported from government women’s colleges. The registrar has now started calling up parents of the errant girls. “The girls are sensitive. We don’t know what they might do once we debar them from writing exams,” Gowda said. The authorities fear the girls could slip into depression, or keep their parents completely in the dark.